Our Common Good If the State provides less, who will provide more? Contemporary Britain is defined by the personal generosity and social commitment of our predecessors as much as by the state. But, as the state retreats, demands on the voluntary sector grow, the gap between the rich and the poor increases and charitable giving stagnates, our way of life is at risk. Will future generations live in a liberal democracy – or a plutocracy devoted to the interests of the rich and powerful? 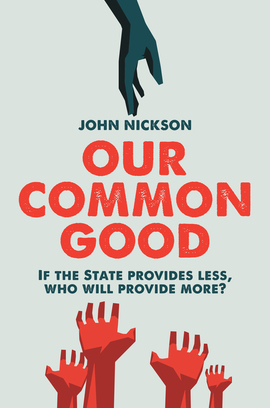 In this timely book, John Nickson, one of Britain’s most experienced and successful fundraisers, argues that there will be catastrophic effects on our democracy unless we all commit to creating the social, cultural and intellectual capital we need to sustain society and our economy. Amid the challenges we face, there are opportunities: not least to transform the role of the state and the way the public, private and voluntary sectors work together to find innovative and enterprising solutions. Our Common Good explores the efforts of philanthropists, social entrepreneurs, and local authority, charity and business leaders, and reveals how their inspiring and practical solutions can build a better and fairer society. “In Britain, we are proud of our mixed economy; the taxes we pay, our charitable donations and our volunteering have all contributed to sustaining our public services and the common good. Now all that is at risk as public services have been slashed and charitable giving has not grown. It is imperative we understand the risk to our democracy. All of us – the state, local government, international corporations, local businesses and individual men and women – must commit to the common good. Our way of life depends upon it.